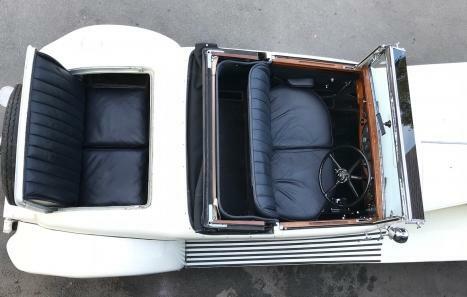 Unexpectedly back on the market due to unforeseen circumstances, we can offer a second chance to buy an exceptionally exciting 'find', being an open Phantom II Continental two door, two seater with dickey, with very sleek, stylish coachwork by H.J. Mulliner, aided by sweeping, open wings, a low windscreen, a beautiful set of stainless steel lamps, including P100S headlights, etc, all of which add to the overall eye-catching appearance. The comprehensive original, special order specification of the chassis, which we have copies of, shows large, 5" tachometer and speedometer, "loudest type of Bosch horn", special attention to the cooling system, and special testing of the chassis when complete. The car started life as a James Young Tourer, but the current H.J. 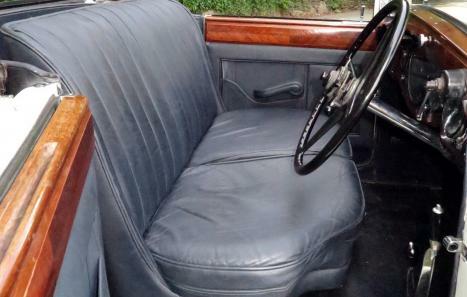 Mulliner body, originally fitted to another PII Continental (149TA), has been on for several decades, something like two thirds of its life in fact. With one family (father & daughter) since 1960, this car is new to the market, and comes with a great deal of history, adding more to the excitement. Cosmetically in some ways slightly shabby, but at the same time very useable in this respect, equipped with a neat cover for the compact hood which folds easily and sits low, and a tonneau cover. Very promising mechanically too, driving particularly well, with delightfully light steering, decent brakes, and with the feel of a car that will get better and better with use, following a decade or so of storage. Having said that, we are currently investigating a potential engine issue, which could be major or minor, and this situation is to be considered in due course. The price includes rectifying this and fully preparing the car for the road, but we are also open to the idea of selling 'as is'. Complete with the aforementioned history file, two impressive, original tool trays, mounted either side of the boot interior, and we have now been successful in having the original, very appropriate, registration number, GY 4050, re-allocated to the car. We are unlikely to ever be able to again offer an opportunity such as this. The first owner of 28MS was Robert McAlpine (1847/1934) who was known in the construction industry as “Concrete Bob”. 28MS was registered at 50 Pall Mall, London which was in fact the firm’s HQ and not a private residence. The car was only with the McAlpine family for a short period partially due to the fact that two generations of the family died in 1934 – Lord Robert & a fortnight later his eldest son, the new Sir Robert McAlpine with the 3rd Baronet in 14 days being Robert’s younger brother Sir William McAlpine. After WWII we find that 28MS has been rebodied as a shooting brake and has moved to Sierra Leone to be used by Dr Geoffrey Cuthbert Tooth (1908/98) as a mobile surgery! Dr Tooth had qualified as a MRCS and a LRCP but later specialised in the field of psychology with particular interest in juvenile delinquency and produced several papers on Studies of Mental Illness in the Gold Coast. Geoffrey’s father Howard Henry Tooth was also a doctor and served in WWI being stationed in Malta and Italy; Geoffrey also served the armed forces during WWII with the Royal Naval Volunteer Reserve. In 1958, two years after 28MS returned to the UK, Geoffrey Tooth had not only relocated to Teheran he had also married a member of the Russian Royal family - Princess Xenia Andreevna, whose paternal grandfather was the 4th son of Grand Duke Michael, a grandson of Tsar Nicholas I; Princess Xenia’s paternal grandmother was Grand Duchess Xenia Alexandrovna – she was the eldest daughter of Tsar Alexander II and the sister of Tsar Nicholas II. Now that is what you call a pedigree! In 1956, after having been imported by J. O. Auclair the PII became the property of Major Cyril Edward Darlington who in 1949 was mistaken for Captain Charles Evan Darlington & it was reported erroneously that Cyril had had the Legion of Merit, Degree of Legionnaire conferred upon him by Harry Truman, President of the United States! A rebuttal notice was placed in The London Gazette to correct the error! By 1960 28MS was with H. R. Wilkins, the family firm of Wilkins & Mitchell dates from the early 1900s and at one stage the firm employed over 1,000 people. Wilkins & Mitchell produced machine tools, power presses and later in 1929 washing machines – Servis Domestic Appliances.